Marriage, much like your car, needs regular maintenance. With your car you regularly wash it, change the oil, get performance checkups, and more- with something as important as marriage, don’t you think you should invest the same level of effort in keeping it at it’s best? Marriage counseling is the equivalent of taking your car to the dealership for a tune up, performance check, and to correct any issues you may have noticed. An article in the Wall Street journal cited that marriage counselors are recommending couples to perform an annual performance evaluation, much like you’d receive at your job. They even have a handy pdf outlining the sort of questions to ask, which you can print off here. If you read through it, you’ll likely notice that it focuses on identifying and verbalizing the positive while coming up with constructive criticism and actionable items to complete- again, almost identical to the rubrics your HR person or manager has used to evaluate performance at work. We think it’s a much more prudent decision to work through these sorts of things in an unbiased, impartial setting with a professional to guide you- after all, if your significant other identified a ‘problem’ that you absolutely disagreed with as being an issue, what would you do? By working with a professional marriage counselor, you’re going to have someone help you outline what is realistic and what sort of daily actionable items you can enact to achieve marital bliss. One of the worst things you can do is wait until there are problems that seem so large you have no other choice but to seek help. According to renowned marriage and relationship expert Dr. John Gottman of Darthmouth University, less than 5% of divorcing couples seek marriage counseling and the average couple waits six years before seeking help for marital problems. Keeping in mind the fact that half of all marriages fail in the first seven years, the average couple lives for far too long with unhappiness- this unhappiness with your most important relationship creeps into all parts of your life, and can impact work, friendships, health, and finances. Marriage therapists agree that more couples can be helped if they seek help earlier, and if you wait too long to seek marriage counseling, the odds are against you. Going into marriage counseling, you need to know that it will take diligence, participation, and work. 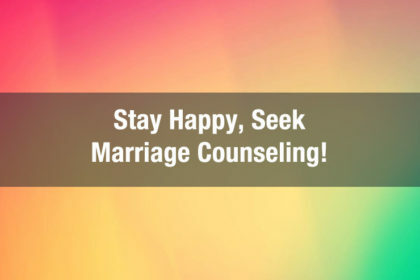 Most people seeking marriage counseling commit to several sessions over a few months to outline the problems, discover the root of the unhappiness, and to produce a plan to work through the issues together. It’s important to remember that there’s no ‘quick fix’ with marriage counseling, and that it will take some effort to get to a place of healing and understanding. Falling in love the first time might have been easy, but once you start “falling out” it will take some time to get back to where you once were. 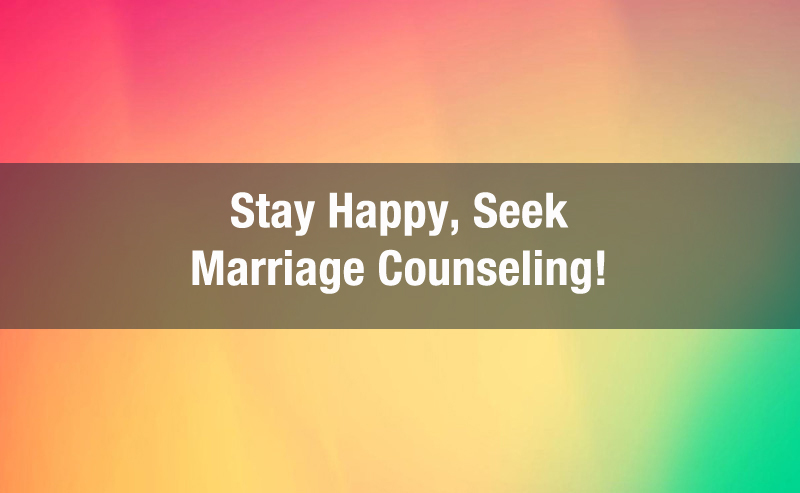 Marriage counseling is generally provided by licensed therapists known as marriage and family therapists. These therapists provide the same mental health services as other therapists, but with a specific focus – a couple’s relationship. Marriage counseling affords you and your spouse numerous ways to bring about change that you would not normally know how to accomplish on your own. It provides a safe and supportive environment for you to identify and communicate the issues, feelings and behaviors that are bothering you, to facilitate understanding and positive change. Contact us today to perform “preventative maintenance” or to help correct issues and get you back to having a happy marriage!